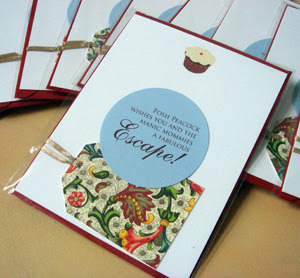 I recently put together assorted blank notecard + gift tag goodies for the upcoming escape being hosted by the Manic Mommies. I thought these looked super cool finished with the personalized sticker I typeset for the event; drop me a line if you are interested in pricing for party favors. I can adjust the card quantity to fit different budgets.